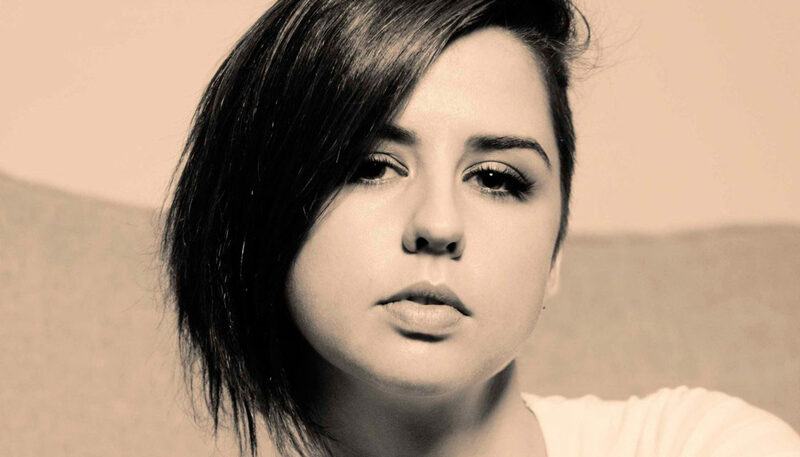 Jazz Pampling is the eyebrow girl of Australia. If anyone is qualified to sculpt those caterpillars above your eyes, it’s Jazz! Successful, famous and in very high demand in the international beauty and fashion industry, Jazz looks back to her high school days. However, for Jazz, the modelling industry wasn’t all happy rainbows, red carpets and bright lights as she’d dreamed. I was just over 6 foot and a size10 but was instructed to be a small 8 to large size 6! I watched my weight and exercised like a champ. I got to the size they wanted, but that was still not enough! I did not understand the industry and how things worked. The agencies didn’t help – as far as I was concerned, they only cared about their cut. Like so many entering the modelling industry, I had stars in my eyes, listening to all the advice from everyone around me. Seeing girls in a similar situation now I think, “Why on earth do you want to be a famous model?” Sometimes it’s because we are missing acceptance in our life – that acceptance comes from within, not from what society says about us. After years of Jazz beating on every door she could find in the world of modelling, none really opened up for her, so at age 23, she decided it was time to make a change. A makeup course seemed the next logical thing to do. A not-particularly-excited Jazz stepped sideways out of modelling and into makeup and… loved it! was a weakness had become the favourite part of my job. 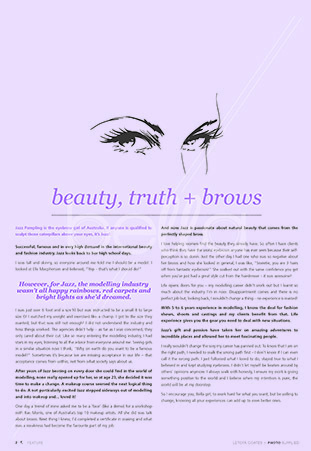 And now Jazz is passionate about natural beauty that comes from the perfectly shaped brow. I love helping women find the beauty they already have. So often I have clients who think they have the worst eyebrows anyone has ever seen because their selfperception is so down. Just the other day I had one who was so negative about her brows and how she looked in general, I was like, “Sweetie, you are 3 hairs off from fantastic eyebrows!” She walked out with the same confidence you get when you’ve just had a great style cut from the hairdresser – it was awesome! Life opens doors for you – my modelling career didn’t work out but I learnt so much about the industry I’m in now. Disappointment comes and there is no perfect job but, looking back, I wouldn’t change a thing – no experience is wasted! With 5 to 6 years experience in modelling, I know the deal for fashion shows, shoots and castings and my clients benefit from that. Life experience gives you the gear you need to deal with new situations. Jazz’s gift and passion have taken her on amazing adventures to incredible places and allowed her to meet fascinating people. I really wouldn’t change the way my career has panned out. To know that I am on the right path, I needed to walk the wrong path first – I don’t know if I can even call it the wrong path. I just followed what I loved to do, stayed true to what I believed in and kept studying eyebrows. I didn’t let myself be beaten around by others’ opinions anymore. I always walk with honesty, I ensure my work is giving something positive to the world and I believe when my intention is pure, the world will be at my doorstep. So I encourage you, Bella girl, to work hard for what you want, but be willing to change, knowing all your experiences can add up to even better ones.